You sound really good playing drums on John Simon's "Out On The Street" album that I sing backup on. Congratulations and you should be proud of your work on that recording. Just checked out the video of you on YouTube from the Cutting Room. Gee, too bad you couldn't get any players. ;-). Outstanding stuff. You and the band sound great. And, I'm familiar with the album you played drums on for my Dad, "A New Album". Dad was right, you do sound great on it. Lucky for Martin! You're gonna make some magic with those instruments, like nobody else can! Your book,'The Featured Drummer', is one of the best drum books off all time. If you like a serious challenge that will open up new ideas, have a look at this. One of my favorites. I picked up a copy in London many years ago. Absolutely miles ahead of it's time back then and still is. I often reference this magnificent publication when I'm faced with an over confident, un -experienced drummer, as humility is a precious, as well as essential attribute in life and music. I'm just going to hunt down my copy in my apartment!!! Just wanted to express my graditude. Your book helped transform and nourish the way I approach music. I like your playing, and your book "The Featured Drummer" have helped me a lot! I'm a drummer/composer living in Edinburgh Scotland. Just wanted to say hi and thanks for your great book The Featured Drummer. I've been enjoying your playing for many years. Mother of Mercy. What playing on the Manhattan Jazz Orchestra's Birdland and Sing, Sing, Sing (lead by arranger David Matthews). Man! You are tops. Very, very witty, relaxed....tasty baby. Straight ahead. 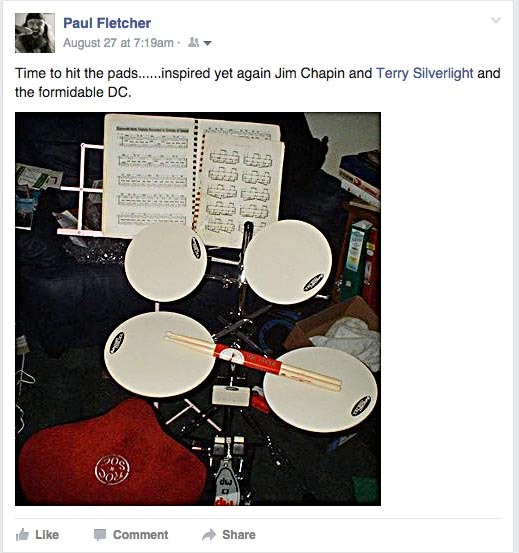 Young players should pattern their playing after Terry Silverlight. It's an honor for me to have played with you and your brother. One of the best events of my life was playing with Al di Meola and auditioning for him and Barry. Barry was incredibly supportive and encouraging. I was just a kid. Both of you have been great influences on my musical and personal life. I might be in town at this time. If so, I will be at your gig. I've been checking out your drumming on Barry Miles's albums and you sound real good. You know how we all have our favorite moments from favorite tunes? Man, when you go double-bass drum on my "On Fire" song on my new album with Frank Gambale wailing on guitar, I must have played those 16 bars a billion times. If I am down in the dumps, I can put that section on and every time, it makes me say, DAAAAAAM!!!!!!! Hey there, Terry. I studied with you back at Drummers Collective 1980-1981. I was an exchange student from israel back then. Ouch Man, couldn't get anybody, huh? What a lineup on your albums..!! Geeze...!! I've been seeing us with Vinnie Zummo on YouTube....Not bad at all, huh? I saw a show on PBS around 1973 lead by Barry Miles with you, Al DiMeola, Eric Kloss and Gene Perla. It was a concert of high energy fusion music and it stuck with me all these years. Has this show ever been available to buy on tape or CD? Must move to NYC, cos I can't get this type of entertaiment in Liverpool. Years ago I remember a great pianist named Barry Miles. His younger brother was Terry SIlverlight. This is the greatest record I have ever heard. Barry Miles is a genius and one of the primary forces in the creation of fusion music. Others have been credited with the development of jazz such as Miles Davis, Chick Corea, Keith Jarrett. Barry Miles should be included in any literature along with all the others without hesitation. If he should ever be left out, it's the fault and limitations of the author/editor to blame. His brother Terry Silverlight, the genius drummer, should also be mentioned, as his performances are documented on all those wonderful recordings. My favorite drum player and very good man. I remember hearing you from the Sky Train record and later on the R&B (Change, BBQ Band) records. You're a great player. I know we'll meet down the line. Keep Swingin' and All the Best to you this year. Always been a big fan since "White Heat" with Pat Martino. Turned my head around. I always hear great things about you to this day. Terry, I am quite familiar with your name from Laura Nyro's 'Mother's Spiritual' album. I met you a couple of decades ago (could it have been at Bard College?) and saw some of your shows. You were an inspiration to my playing and attitude. I first heard your great, masterful grooves on Larry Hoppen's CD along with Tony Levin and David Sancious. Being a Beatles fan, the groove on "No Reply" is awe inspiring. That's true genius to me when you take a masterpiece and enhance it. Not to mention all the great, groovin' tunes on that CD. I will come get to see you without a doubt, and listen to any project you're a part of as a musician. I aspire to be a megabyte as groovin' and creative as you are. You are the best big band drummer! You are the epitome of what a drummer should do when he plays any style. You catch everything! You have my ultimate respect. I pray I see you live someday. I did the first BB&Q Band tour after you did the record and I've always dug your style. Your playing has always inspired me. Thank you! Smokin"....Man, you and Will have such a great hook up....Band is on fire.....Thanks for sharing. I was listening to Dave Shank's session again, and there's a moment you and I have some great interaction. About half way through the soprano solo to the end of it, this thing happens--like one mind. When I heard that I felt, "Oh yeah, that's what it's all about!". You had great telepathy there. It was great to finally meet you and record your artistry. You and John Patitucci carved out a huge groove trench and your kit was unreal. Great playing, great sounds! Thanks so much for coming and lending your talents to the impromptu show that we put on. You play with such authority. It's unmistakenly Terry Silverlight! We all enjoyed playing with you. Just got an unopened copy of Eric Kloss's BODIES WARMTH on vinyl that you play drums on... ;-) Yay! Had a long drive to my gig yesterday and was listening to you and your brother Barry on the whole ride down (Miles Of Genius, Scatbird, White Heat & Sky Train.) Incredible music and SO inspiring! It occurred to me several years ago that Barry invented fusion. You were younger but I know you helped him develop his ideas. (Back in the mid-60's, before anyone else, when you were both KIDS and before it was even called "fusion"...I believe Barry called it "syncretic music". I'm a huge fan of all the greats of the genre. But you guys did it first...and the world needs to know that. You, Barry and all the great musicians who played with you back then deserve SO much more credit for what you created and for being the innovators and pioneers you are. Seriously, had I known your full history back when I first met you playing together on Gil Parris's "Blue Thumb" album (and Harvie S too...he was also there at the beginning), I probably wouldn't have been able to put two notes together when we played. The fact that neither of you never even mentioned it back then to my ignorant younger self probably also makes you among the most humble musicians who ever walked the planet. You and Barry were a child prodigies who helped create something totally unprecedented...which changed MUSIC and inspired other geniuses. That's as heavy as it gets. Anyway, just want to tell you how much I appreciate you guys, and how grateful I am for what you, your brother and your various bands created. You are a truly amazing musician, drummer, educator, and friend. You've always inspired everyone who's had the pleasure and honor of sharing a bandstand with you. Despite your impressive resume and accomplishments that are almost too numerous to mention, you've remained humble and are one of the easiest and most professional free-lance musicians in the business! It's no wonder that you are 'first call' for so many entertainment figures! I hope all is well and that we can play together again very soon. Just wanted you to know I really like the music you've been making. Keeping that North Plainfield High School pianist Bill Evans legacy going must be a lot of fun. I miss you playing drums at my Blues Night in 1988, and boy was that ever fun on top of fun x 1000. Just watched you on youtube. You sound better than ever. Hey Terry..!!!!! !....great to know you are ALWAYS doing hi-quality music !!! --Alberto Bengolea (Composer/producer/guitarist extraordinaire) Wow---*very* impressive. I was always blown away by you and your brother back in the old days, but it's nice to revisit your playing and see just how good it actually is. I really enjoyed your last gig at the Cutting Room. You have been given the distinction as "my favorite drummer" after that night. Thanks for the great music and great playing! Your friend and fellow studio musician/guitarist Carmine D'Amico. I hope we get a chance to play together soon. I always enjoyed your total musicianship, and positive attitude. One night at a club in Jersey somewhere, your brother Barry brought you in and we had quite a jam session. You were probably 19 or younger. Your CDs sound great and I still listen to "White Heat". Terry - you are a very gifted musician and producer. I'm proud to know you and prouder still that we've written a couple of very fine songs together. 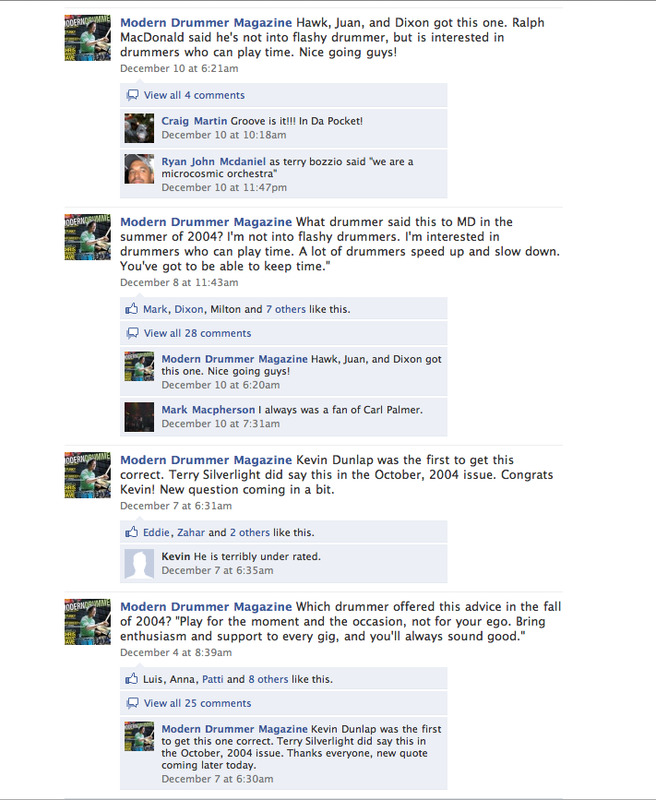 The interview you did with Drumradio at the Cutting Room was very positively inspiring... Thanks so much for all your huge encouragement and belief in my abilities. It means a lot coming from a drum master like you. TERRY LAST NITE SHOW WAS SMOKIN! GREAT WRITING! TIGHT BAND! YOU GOT TO DO MORE? WE ALL WALKED OUT WITH BIG SMILES ON OUR FACES!!! Hey Terry...my old friend from Ratso's. I never thought after searching record stores for so many years that I would ever be able to correspond with you. Thanks for being so nice to me and emailing back. Truly an honor to be counted among your friends. i admire your playing immensely. Big fan of yours and brother Barry's since the early 70's!! You're the reason I gave up drums. This album was one of the first recordings that convinced me to adapt some of the lines and tonalities of modern jazz to the five string banjo. One of the lines in Tony Trischka's and Peter Wernick's book Masters of the 5-string banjo is something I copped from Pat Martino's playing here. A very exciting and propulsive record. Appropriately, I nominate Terry Silverlight, whose amazing drumming drives this recording. Having been a student of bassist Gerry Carboy's for several years, I can tell you that all he ever did was speak of you in the most reverent tones....! BIG inspiration for me 'til this day!! Terry is an amazingly creative and generous musician. When performing he knows how to back singers as well as instrumentalists. Terry is on my recording "Something's Coming" (produced by Mike Abene) and played the two hardest arrangements beautifully. I highly recommend Terry! I sent Terry some mp3's and some pdf's, and he sent me back KILLING drum tracks, completely appropriate to the style, and even gave me bonus tracks of additional fills to crosscut... I've known Terry for years, and he's one of my favorite drummers, and I'm lucky that he also does production via FTP! Saw you at the Jazz Workshop in Boston w/ Barry Miles, Harvie S and Vic Juris...1974! great player. It was an honor to work with you ~ you are such an amazing player and writer. I'm very glad things have gone so well for you. I only wish we could write more together. You're a gift to work with. Your support and friendship has always meant a lot to me. If you give me advance notice of your coming over to Italy, I will try to get you into a gig, OK? I am a long time fan, and get this: also a fan of your brother as a drummer (dad gave me his album as a youngster.) And love him with Al Dimeola. Of course I love your playing style. I am a drummer and a big fan of yours. You did White Heat when you were only 14 and were only 15 and 16 on the other Barry Miles records. Geesh, no disrespect but you should be as famous as Tony Williams. You have brought alot of joy to me over the years. I have your album and really dig it. You sound wonderful . And the production is fantastic ! I've seen the clips on You-Tube from The Metro , Wow, great band! I've loved your work for a long time now. I have so many of your albums from the 70s/80s... so glad you are still swingin' after all these years. Barry and your contributions to the music have been impressive but not a suprise to me. As a jazz buff formerly from NYC, I remember how awesome your drumming is. Also a fan big of Barry Miles. I heard you play with Mark Egan at the 55 Bar in the late 90's... I really admire your playing! I have a Barry Miles album from the late 70's with you on it. It was inspirational at the time. I probably wore the grooves in that album smooth. I still remember your playing from back then. Your talent stuck with me. It's good to see you're still stackin beats. I want to tell you that the ideas in your book are fantastic . I have been enjoying it . Any other books in the works? What an honor! I love your CDs and that DVD with the Manhattan Jazz Orchestra. For years I dreamed to watch you perform, so, when I got the DVD, it was a "revelation". Once Again. Love hearing you play! What a Joy!!!! I doubt that you will remember me. I was a student of Muzzy's. I see that you have done very well for yourself. It's a good thing to see. .....and Terry Silverlight KILLED IT!!!! (Those double kicks on On Fire with Gambale's screaming....boy oh boy). I started playing bass when I was 15. Right after that was the fusion movement - Mahavishnu, Weather Report, etc. I had two friends and we'd gather in their basement and listen to all the fusion stuff, laughing at the chops, odd time signatures, etc. It was fantasy stuff at the time. One of our favorite groups was Bsrry Miles & Silverlight....two great, great musicians who are brothers. So, to go from those days to having them both on my debut CD is some kind of special! Basil Fearrington turned me on to these guys. (Barry Miles & Silverlight) I thought they were something else. I saw them live at Treys in Brickyard once. Great show! I always love to hear just bass and drums and these two great players together, Will Lee and Terry Silverlight on Terry's newest release Duets Remix! It's DEEP! Check it out! I studied with him 30 years ago. Great.Thanks for uploading this amazing performance. Great solo, Terry! I love it! Please, post some Barry Miles & Silverlight videos as well if you have any. Or any Barry Miles solos (either solo or with group). I love this video! I have his book THE FEATURED DRUMMER. It's great. You rock, Terry! Cool! Terry do you have any footage from the Sky Train sessions? The PBS video, etc? Funky-funky and Barry, too ! Oh my God! Happy to see Terry in action for the first time. Fantastic drumming, after listening to many of his LPs over the years. Thanks a million for putting this up... I'd love to see the whole thing! Would be fun to see some 70's stuff as well! So nice to hear that one of the most fluid and propulsive drummers I ever heard is going strong and better than ever. The thrill and shock value of my first listening to Scatbird has not diminished one bit since the early 70's. And Barry was one of the few players I ever heard who could make one of those﻿ old RMI pianos sound like it had some depth and character, which is not an easy thing to do. Soundz amazing!!!!!!!! !﻿ Burning it up Terry!